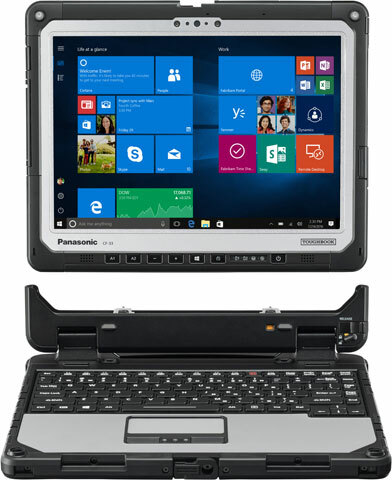 Panasonic has announced the U.S. availability of the Panasonic Toughbook 33, the first fully-rugged 2-in-1 detachable laptop that features a 3:2 display. Inspired by the hard-working mobile professionals who have relied on the Toughbook brand for two decades, the Toughbook 33 2-in-1 detachable laptop delivers rugged mobility in a highly customizable package along with a generation of backward compatibility for mobile professionals. Designed in consultation with Toughbook device users from a number of demanding industries including police, fire, government and enterprise professionals, the 12” fully-rugged 2-in-1 detachable laptop is designed to meet MIL-STD-810G and IP65 standards to perform in even the most grueling and extreme conditions. The Toughbook 33 2-in-1 laptop comes with a groundbreaking 3:2 display making it easier to handle, and ideal for workers viewing business applications like law enforcement officers using Computer Aided Dispatch (CAD). Other benefits of a 3:2 over a widescreen include less vertical scrolling, an aspect ratio that better approximates the feel of 8.5 x 11 paper and less interference around airbag zones for better vehicle-occupant safety.